Published in print in over the last decade, Eric and the Enchanted Leaf is a series of books by Deborah K. Frontiera. The stories are about a little boy who discovers a magic leaf that can transport (and transform) him to learn more about nature's misunderstood creatures. In the first book he learns about spiders, in the 2nd title he appreciates the wolf and in this slightly spooky volume, Eric joins a bat named Echo. With all three now available in digital or print, this award-winning series can charm children and their parents for decades to come. Each title is also available (sold separately) in Spanish. 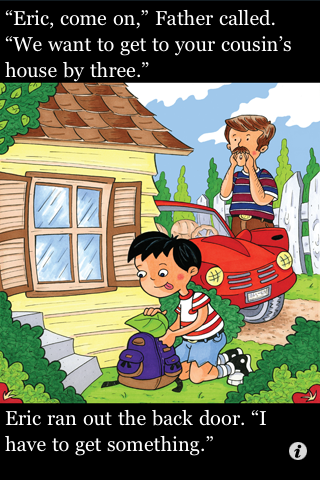 This book, 3rd in the series, features a different illustrator than the first two books with a more cartoonish quality, something that will appeal especially well to children. The storytelling is superb and titles like this that have been vetted by the children's publishing world first in print are particularly effortless choices for parents & educators alike. In digital form, this title is not animated or enhanced in any way (not even highlighting as narrated), but despite the simplicity (or maybe because of it?) the storytelling really stands out. My little boy loves this book and it has emerged as a favorite overnight. Children can imagine their own adventures if they had an enchanted leaf, creating lots of expanded activities based on the story. Currently my child would like to find out what it's like to be a cat. Overall, this is a solidly made title from PicPocket Books, where the story takes center stage. If I were to suggest any improvements, I'd probably go with adding highlighting as narrated and a page guide and/or home button. Other than that, this title is a perfect blend of educational content (a glossary of terms appears at the end of the book) and great storytelling, capturing the imaginations of young readers and listeners. A great series of apps! Eric is on his way to visit his cousin in Texas and he is sure to bring his 'enchanted' leaf with him. 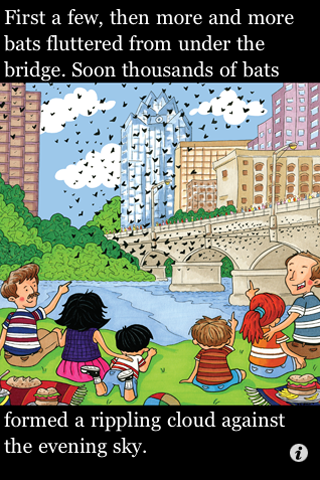 Shortly after arriving, the whole family goes downtown in Austin to see the bats fly out from under the Congress Avenue Bridge. It's a beautiful sight with thousands of bats forming 'a rippling cloud against the evening sky'. 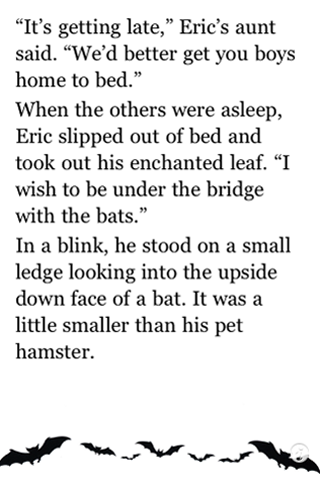 Later that night, Eric slips out of bed and wishes on his leaf to be under the bridge with the bats. Suddenly he is standing on a ledge under the bridge talking to a bat named "Echo". Echo teaches Eric about how bats can see a little and hear using echolocation. 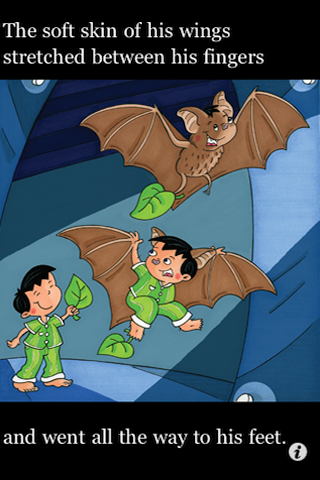 Eric then wishes upon the leaf again to make himself into a bat (holding onto the leaf with his toes to be sure not to lose it so he can return to being human later). Echo and Eric fly into the night sky. Eric discovers so many new sounds and watches Echo snap up insects right from the air. The two also visit a river for a quick drink of water. 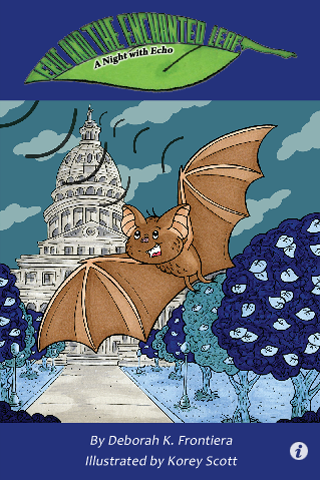 Eric learns more about what bats eat, where they live and other interesting facts (including info about rabies).